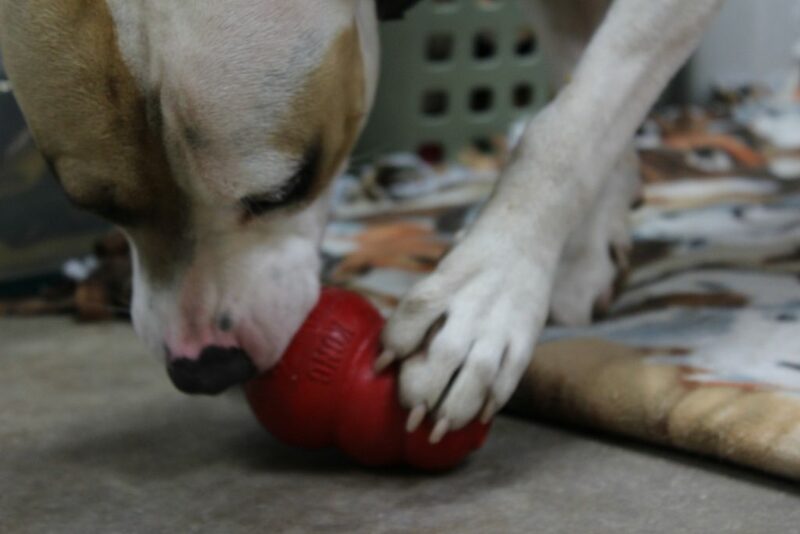 SCHS used the KONG Toy Grant to replace our older, worn-out KONG toys that are used for enrichment activities. At the end of each operational day, every dog in general population (30 in total) was given a KONG toy in order to encourage positive stimulation. The majority of the dogs under the care of SCHS are larger, higher-energy animals. The KONG toys proved to be extremely valuable in helping such dogs by enriching their time spent in the kennel and providing much-needed stimulation. By creating positive enrichment, the products given to our shelter through the KONG Toy Grant extended the amount of time we could spend finding the perfect adopting family for our shelter dogs and improved each animal’s mental well-being. 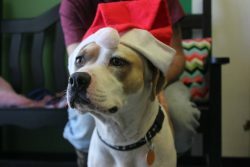 Nikko, a 1-year-old pit bull, was one of the shelter dogs who most benefited from the KONG Toy Grant. Nikko was housed in the shelter for more than 10 weeks before he found his family. Before that point, however, our kennel technicians noticed he exhibited anxious and frustrated behavior when it was time for him to enter his kennel for the evening. His young age, combined with his breed, created a lot of unspent energy. 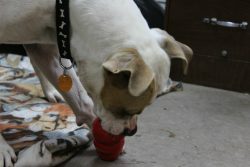 To combat this, Nikko was given two different types of Kong toys to play with every evening. Almost immediately, his behavior began to improve. His pacing and barking while in the kennels stopped altogether. In fact, Nikko’s overall personality changed. 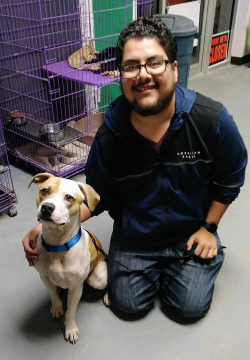 When he first entered the shelter, Nikko was standoffish and slow to warm up to new people. Because of the enrichment activities offered to him, Nikko suddenly began to show a warm, friendly, and extremely intelligent personality. It was clear to our staff that his emotional health was improving. When Nikko’s person came to meet him on Nov. 30, Nikko approached him without aggression or nervousness. It was the perfect match, and Nikko has now been adopted.